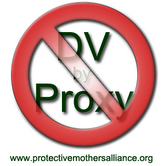 This article about DV By Proxy give an example of both genders being guilty of alienation. The world of divorce is scary for any child. Even when spouses split amicably children can be forced to balance their love and time between two parents. Pamela Richardson and her son Dash are seen in an undated image. For almost 12 years, Richardson rarely saw her son because of a campaign by her ex-husband. Justice Harvey Brownstone, a family court judge in Toronto, is the author of a book on how divorce and custody battles affect children. Psychologists Peggie Ward and Robin Deutsch run a camp in Vermont that aims to bring together feuding parents and children together. But when a divorce becomes especially toxic children can become the target of an unrelenting crusade by one parent to destroy the child’s relationship with the other. Experts call it parental alienation, a persistent campaign by one parent to poison a child’s relationship with the other parent. Typical tactics include lying or making false allegations about the targeted parent, refusing to let the child see the other parent, even punishing the child for showing affection for the other parent. Experts claim, in its more extreme forms, it is child abuse. For almost 12 years, Pamela Richardson rarely saw her son Dash because of the campaign her ex-husband waged against her. According to Richardson, after her marriage dissolved her ex-husband, who had custody of the then-four-year-old, did everything he could to alienate Dash from his mother – fabricating illness, booking activities for Dash to prevent visits; he even arranged to have Richardson banned from Dash’s school. “I wouldn’t see Dash for, you know, a number of months and not without me trying, not without me doing all the classic things that alienated parents do — cookies on the doorstop, faxes, phone calls, notes, trying to see him at friends’ houses — everything you possibly can to keep that thread of a relationship alive,” said Richardson. Despite a court order giving her regular visits with Dash, Richardson said her ex-husband did everything he could to keep them apart and to convince their son that she was a bad and uncaring mother. “There was period of two years, and I added up the hours (with Dash) and it came to 24 – in two years,” Richardson lamented. Richardson said she wasn’t the only one suffering as a result of the alienation – Dash was suffering too. Alienated from his mother, the once happy little boy turned into an isolated, depressed and angry teenager. On January 1, 2001, Dash, then 16, jumped off Vancouver’s Granville Street bridge, in the middle of the night, to his death. While Richardson blames her ex-husband, she also blames a court system that she insists did little to intervene and help. “This is extreme and this was something that was in the courts many, many times…they had an opportunity to do something and they didn’t,” said Richardson. Courts are paying more attention. Family court judges are increasingly considering issues of parental alienation in deciding custody. Justice Harvey Brownstone is a family court judge in Toronto and the author of a book on the bitter realities of divorce court. “Parents who are on a campaign to destroy the child’s relationship with the other parent could lose custody and, in extreme cases, courts have changed custody to the other parent,” said Brownstone. He encourages divorcing couples to focus on parenting together rather than using children as a tool of revenge, dragging them through protracted, bitter family feuds. Two years ago Tori’s parents Fran Beecy and Chris Cercone couldn’t stand to be in the same room after Beecy made abuse allegations against her ex-husband. Divorce camp in Vermont changed everything. Today, they visit together, gather for family dinners, and get along.